With the Tuna Trio yesterday, I’m kinda tuna’d out. So I thought this recipe would be a nice change of pace. This is one of Baby Lady’s favorite recipes and she will be happy I posted it without her asking me to do so. It is also one of my favorites, too. Baby Lady & I always eat a balanced meal and are always looking for new ways to fix old favorites. I like Cauliflower and Red Chiles. When I found this recipe, it was a match made in heaven. Now before you stop reading, this is not hot. It has a little warmth but this recipe is all about flavor. The cauliflower is SLOW ROASTED at 325 F. Wile you can cook the cauliflower faster at higher temps or using a convection oven, don’t because SLOW ROASTING permits the cauliflower to absorb the chile flavor gradually and turn a lovely golden color as shown in the photo above. There is a sweetness from the slow roasting and caramelization of the cauliflower that you don’t get otherwise, the earthiness from the red chile, smokiness from the cumin and roasted chiles, tang and brightness from the lime and a floral element from the chopped cilantro at the end. This dish absolutely sings. We hope you try it and like it. As Elia and I were leisurely strolling the shops in Mesilla, New Mexico we saw a book we simply couldn’t resist. It was the Red Chile Bible: Southwest Classic & Gourmet Recipes by Kathleen Hansel, Audrey Jenkins. I love small paperback cookbooks written by locals. In this case Kathleen Hansel and Audrey Jenkins are caterers in Santa Fe, a few miles north. Regardless, as we were perusing the book to see if we liked it, I found this recipe. Once I saw the recipe, I bought the book. Our recipe is modified from the original because Chimayo chiles are difficult to find outside of New Mexico. Chimayo chiles will cross pollinate with almost any other chile so it takes a lot of dedication to preserve the chile. As such, it is in scarce supply and typically found in Northern New Mexico. Audrey Jenkins and Kathleen Hansel, living in Santa Fe, had ready availability to Chimayo chile. We made some substitutions and this is what we did. Preheat oven to 325 F. Separate the florets from the Cauliflower. Put them in a bowl with the garlic, chile powder, crushed chile, cumin, salt & olive oil and toss gently to mix together and coat well. 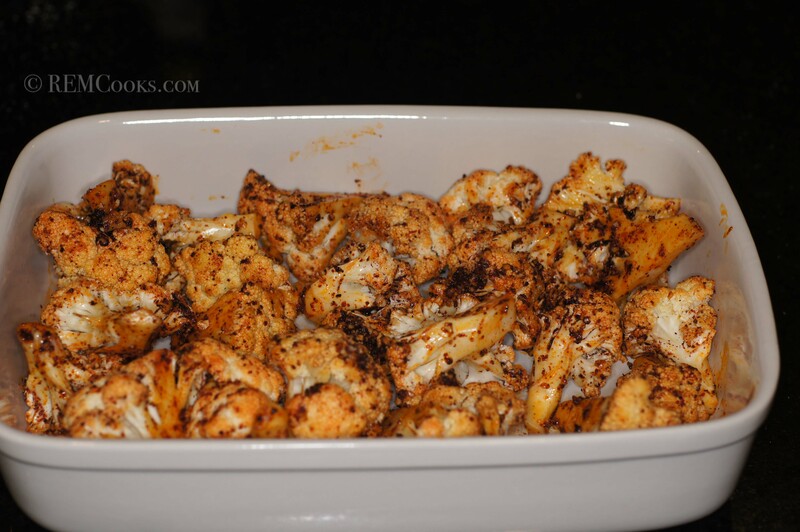 Spread the seasoned Cauliflower in a shallow roasting pan. Roast 1 to 1-1/2 hours or until tender, stirring occasionally. Finish with chopped cilantro leaves. 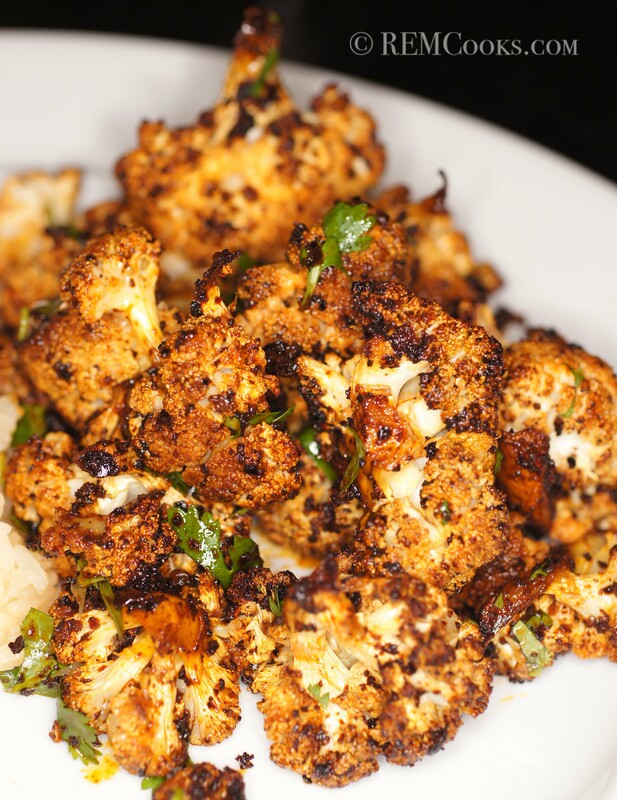 Roasted Cauliflower with Red Chile, Cilantro & Lime – You know you want it. We do a variation of this recipe using a combination of broccoli and cauliflower to which we add onions, as well. The onions add a little sweetness to the dish and keep it a little more moist. The broccoli roasts beautifully and the little florets pick up the little tidbits of garlic and chile powder. Give this a try. NOTES: You can also try this treatment with Broccoli, Turnips, Parsnips & Carrots although the cooking time may vary. Now, if you’re one of those folks on Pinterest and elsewhere who want to cook this quicker at oven temperatures of 400+ F because you like it crunchier, that is fine with me. Just do not use olive oil. Find another substitute for the olive oil because olive oil breaks down above 350 F, becomes toxic and acquires an off putting taste. If you’re concerned the cauliflower won’t get those nice little roasted, crusty bits at 325 F, you’re wrong. You get the same effect at 325 F that you will get at 400+ F but it will take you longer and you cannot crowd the pan. Crowding the pan, either at 350 F or 400 F will result in you steaming the cauliflower NOT roasting it. I’m not a big cauliflower person but this sounds delicious! Thanks. I hope you give it a try. Seriously amazing! I know what I am eating tonight! Thanks for dropping by and commenting. I love your blog and don’t follow too many. The photos on your blog are beautiful. This cauliflower recipe has gotten more hits than any other recipe on the blog by a wide margin. It is seriously good and I hope you try it. I love cauliflower, this dish looks amazing! I will give it a try. This is a great recipe. Of all the recipes on the blog, this has gotten the most hits by almost a 7:1 ratio. It has been pinned and re-pinned beyond belief and has taken on somewhat of a life of its own. 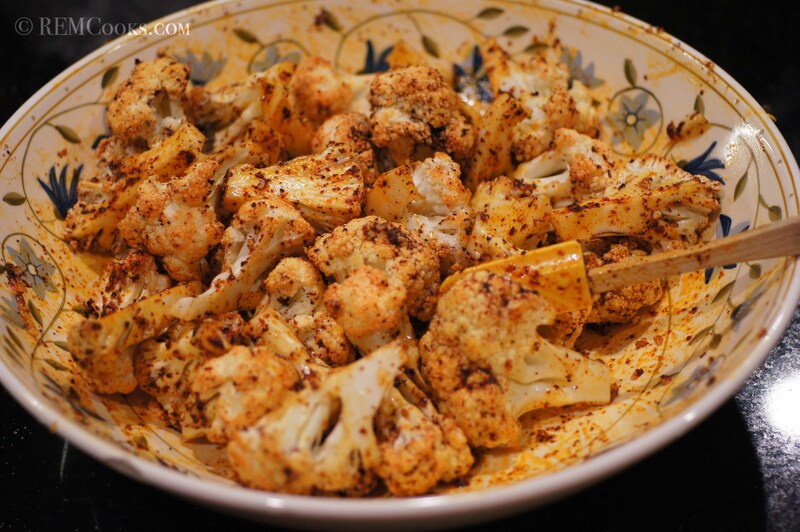 If you like cauliflower, you will love this recipe. If you don’t like cauliflower, you may still love this recipe. I don’t like cauliflower, yet ate half a head in one day with this recipe! A- mazing!!! I haven’t tried it that way bit I’m sure it would with the chiles and lime. I think I would prefer it with a pilsner as opposed to a lager or a dark beer though. Thanks for visiting my blog. This looks delicious. I hope you don’t mind (since its not your recipe hopefully you won’t) I am going to make a couple of changes, mostly around the chiles, the chile powder and how to combine the ingredients using a molcajete. Look forward to more! You can’t offend me changing a recipe even if it were mine. Cooking and sharing recipes is all about the experience of taste, technique and cooking. I use different chiles than recommended in the recipe, as well. It’s just good. Thanks for reblogging. Try making your own chile flakes by dry-roasting some anchos and chiles chipotle meccas (these are the dried ones) all of these can be found at Casa Lucas on 24th and Alabama Sts. Dry roast on the comal until charred but not burnt and break up into small pieces using the molcajete- the chiptole meccas are sort of sort so you’ll need to mince them with a sharp knife, then combine flaked chiles with the garlic, kosher or sea salt (any kind of coarse salt), crush ingredients well in the molcajete, add the olive oil and follow recipe here. 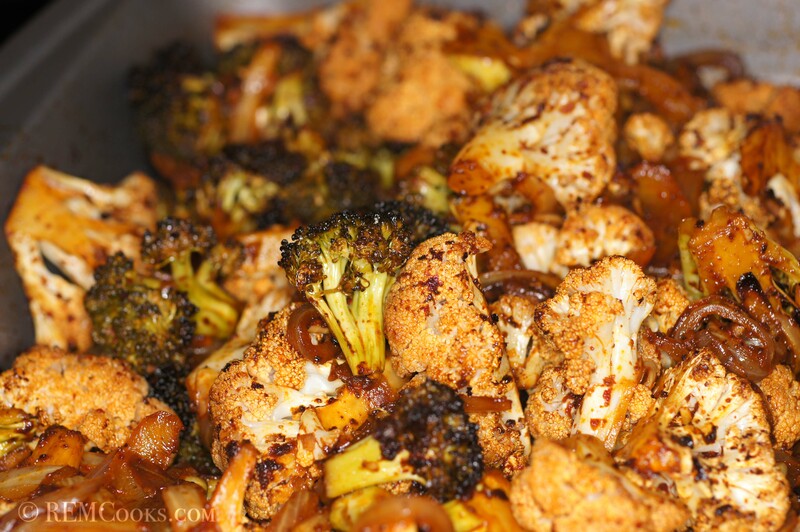 I LOVE roasted cauliflower & broccoli! All veggies really! But I’m especially loving the Mexican twist! Cumin-lime-chili-cilantro on everything!! Thanks for your comment. This is really a great veggie dish! Very impressive. A simple set of ingredients and a fantastic looking photo. I love the idea of cauliflower and lime. Very inventive. It’s funny you would pick this recipe. This recipe has had the most views of any recipe on the blog by over a 6:1 margin. It has been pinned and repined on pinterest beyond anything we ever imagined and at times drives the hits on the blog. I wish I could take credit for the recipe but I can’t. Like everyone else, when reading the cookbook, this recipe caught our attention so we bought the book. It is a very good recipe. While we believe there are other recipes that are much better, there is something about this recipe that strikes a cord with everyone, us included. It really has a life of its own. Thanks for dropping by and your nice comments. I found it on Pinterest so that’s why I’m here. It really sounds wonderful! Gotta try it! I’ve tried it with just lemon but love the lime cumin twist. Nice. I was surfing the web for good recipes that are GMO free and that taste good also. I’m having a dinner party this Saturday which includes my father who is suffering from cancer. Anyway, he is very sceptical about changing his diet, when I ran accross your recipe for roasted cauliflower I got excited, “Dad LOVES Cauliflower!!!! So THANK YOU!!!!!! From the bottom of my heart!!! Saturdays dinner I will be serving Grilled wild caught Salmon, baked sweet potatoes and yes ROASTED CAULIFLOWER!!!!! dad is going to be surprised!!! Once again Thank You!!! I made this with cauliflower, carrots, onion, and a jalapeno. I used chipotle powder because that’s what I had. Dh and I loved it. I’ll definitely make it again and again. I can’t imagine what veggie combo wouldn’t benefit from this seasoning. Thank you for dropping by and your nice comment. I’m glad you tried the recipe and liked it enough you will now include it in your standard repitoire. Chipotle chile would be a nice seasoning. I make a 6 chile blend that I like to use with this dish. Different chiles have uniquely different tastes and spice. It’s fun to experiment with them. Thanks for dropping by the site and your nice comment. Glad you stumbled across it as well. This is the most popular dish on the blog by a wide margin and it is absolutely delicious. I hope you give it a try. Thanks for dropping by and your nice comment. This is a remarkably delicious way to fix cauliflower. I hope you try it. Thanks for dropping by and your nice comment. This recipe has been pinned and repinned on Pinterest innumerable times. It is amazingly popular and actually drives the hits on the blog. We like it a lot. This looks great and different from the way I roast most a lot of my veggies. I’m going to try this when I do my Sunday prep this weekend because I love cilantro!!!! I’m a huge believer in veggies being key to keeping weight or getting it off. They helped me lose 110lbs so I’m always looking for the fresh ideas. Thanks! Thanks for dropping by and your nice comment. I think you will like this recipe a lot. It’s packed with flavor and good for you, too. I made this the other day but the lazy version – with just red chili powder and I didn’t toast the cumin seeds. I also sprinkled lemon on before I baked it. It came out great! Sweet, actually! And so, so yummy! Thanks for dropping by and your nice compliment. I’m very glad you liked it. We like it a lot and it is one of the few dishes we will eat several times a year. Looks amazing! Do you serve this as a side, with another dish or by itself? I think I would love it enough to just munch on it alone! Thank you for dropping by and your very nice compliment. Hope you got a chance to browse the blog while you were here. We typically serve it as a side dish but have been known to eat it alone for a light dinner. It is the very best cauliflower dish we have ever found, bar none. I hope this helps. I think your husband will like this a lot. This sounds and looks so good. This might be a dumb question, but what is crushed dried red chile. I’m not sure and I’d like to make this. Dried crushed red chile can be all sorts of dried crushed red pepper (chile) flakes. It adds a touch of heat. Ancho chiles are very mild chiles and New Mexico Reds are even milder. We like a little more heat so we add dried crushed pepper flakes. My favorite version of this recipe is a blend of 6 different red chiles. If you mix the chiles you can control the level of heat and alter the flavor. We are so glad you liked it. Thanks for taking the time to drop by and leave your vey nice compliment. My little guy is 8 months old and we’re adding cauliflower to his foods in a few days. I bought the head but want to eat some myself. I found this recipe on pinterest, like so many others. 🙂 I’m not familiar with ancho chile pepper. Is it a spice I can find at the grocery store? Also, and this is my main question. Is that a citrus juicer in your picture? I haven’t seen that kitchen gadget before. I’m in the market for a non-powered juicer and that looks nicer/better than the basic lemon juicer that I was thinking of purchasing. Ancho chile is the basic ingredient of chili powder. It also has oregano, cumin, garlic powder but roughly 98 % of chili powder is ancho chili powder. Ancho chiles are ripened, dried poblano peppers. I buy the peppers, seed and stem them, toast them quickly on a comal and blend them into a powder. From an 8 month old perspective I’m not certain I would feed him chili powder as of yet but I know other parents who have done so. As for the juicer, we bought it at Williams-Sonoma, I think. Its a very nice one. The juicer is a Chef’n ForceFresh Lemon Juicer. You can find it readily available online. It runs roughly $20 but works wonderfully well. Cant wait to try this!! i love cauliflower so its a win, win for me 🙂 What temp do you roast it at? Love the sound of the cauli, lime and parsley – not so keen on chili so I might try it without (hmm, maybe with some sweet paprika). I have recently been diagnosed as diabetic so I’m using cauli a lot as a potato substitute – last week it was a combination of mashed cauli and sweet potato with a sprinkle of shredded cheese as a topping for a “potato” pie – sooo good! Chile, lime and cilantro are wonderful flavor combinations. You can use a variety of chiles depending upon how flavorful you want the chile to be and how hot you want it. There are many chiles, i.e. sweet paprika, that have little to no heat. Ancho chile is a very mild chile but packs a lot of flavor. New Mexico reds are also mild but flavorful. Just play with the recipe. It is really good. This is now one of my new best friends! Love it. Thanks, we’re glad you liked it. I just saw this link on Pinterest…so gonna make this for dinner tomorrow! We’re glad you found it. 🙂 Let us know what you think. Thanks for trying it and letting us know how you like it. 🙂 We appreciate your feedback and are glad you liked it. This sounds so yummy. We love cauli, all the chili powders, cumin, lemon etc. How would it work with lime instead of lemon? Am definitely going to try this soon. I also think it would rock to make this with Brussels Sprouts. The post is with lime and it’s excellent. It will also work with lemon but it loses some of the brightness and acidity the lime brings. I just tried this recipe and its absolutely delicious. Thanks for sharing! We’re so glad you liked it. 😀 You’re more than welcome and we hope you look at our other recipes, too. I’m another one of the bunch who found you through Pinterest! I’m a Texan but love N.M. inspired food. I’m about to try this recipe and can’t wait to dig in! My daughter is vegetarian so I’ll add it to my recipe box. It’s not vegan but it is vegetarian if you omit the egg. It is full of flavor and very simple to make. Please provide access to a printer friendly page. I would love to do so but I haven’t figured that out yet on WordPress.com. WordPress.org allows you to do so on a self hosted site but I will see what I can do. Thanks. I have tried a few things with no success. Right now, to provide you a “printer friendly” page, I would have to completely redo the format of the blog. Please accept my apologies. Thanks so much for your very nice compliment. We love this cauliflower recipe. This was amazing!! Thanks for sharing! Thank you for trying the recipe and taking the time to comment. We are thrilled you liked the recipe. 🙂 Hopefully, we have interested you enough to check out some of our other recipes, as well. We love to share. Thank you again for your very nice compliment. 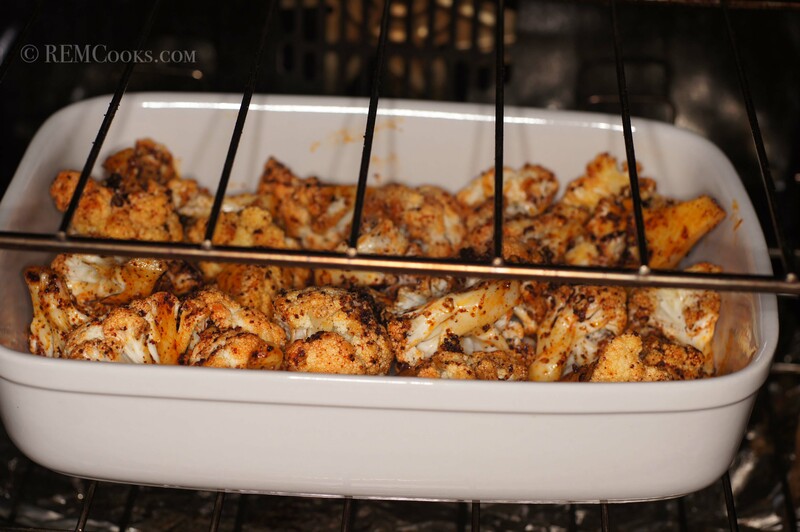 Love roasted cauliflower will definitely give this a try! Thanks! Love love love it! It’s an addiction! Thank you. We’re so glad you like it. 🙂 Hopefully, there are other recipes here that will excite you as well. We hope to see you around. Just found this recipe on Pinterest, and it looks fantastic! We are trying to add more vegetables into our diet, and this seems like a great way to make sure my husband and son think that vegetables are delicious, not just nutritious. I will be sure to stop back again to check out your other recipes! I’m glad you commented on my roasted cauliflower and mentioned your recipe so I could check this out. This is going to be the next cauliflower recipe I try. Thanks for sharing it. ………a keeper!…..this is so tasty with a beautiful presentation to boot!!! !thanks for sharing! I have some dried ancho peppers I have been meaning to use for ages that I think I will try instead of the powder. Will let you know how it turns out! I love experimenting with my own recipes, but I use pinterest so much that I have become addicted to trying out recipes on there, so I understand your posting a recipe from another source, and appreciate you being honest about it, and I’m sure the writers of the book appreciate the exposure! Thanks for dropping by and commenting. We hope you like it. I like to do a 6 chile blend because of the added depth of flavor from the different chiles. Insofar as giving credit where credit is due, I hate people who take things from another source and post them as their own. The recipe on the blog has a few minor modifications from the original and there are a couple of people on the web who have posted it (along with my photo) as their own or posted it as coming directly from the Red Chile Bible cookbook. It’s annoying and, as it concerns one person who had published the recipe AND my photo as their own, I had it pulled from their website for violation of copyright. It’s just not right. We’ve have been so surprised and tickled with the popularity of the recipe that we notified Audrey Jenkins, one of the original authors, of the recipe’s success. We hope people are checking out other recipes in their cookbook. It really is delightful. Is The crushed red Chile the same as crushed red pepper? yes. it adds a little heat because the chiles are mild. Mr McGary, I saw this on Pinterest several times, but tonight was the first chance I’ve had to make it. I even went out and got a shallow baking dish and the few spices I didn’t have. I love vegetables and this sounds and looks awesome. Thank you for the great recipe and your awesome blog! OMG I am hooked a friend gave me some and I am hittin up HEB tonight this is awesome and healthy thank you!!!! Thanks for dropping by and commenting. We’re glad you liked it. 🙂 Please try some of our other recipes. We think you will like them, too. It is in the oven cooking right now!!! Smells so good!!! Thanks for dropping by and your very nice comment. I like Tony Chachere seasoning on a lot of things. I would imagine it would be great with cauliflower. If you try this with the cauliflower, do not seal the foil as you want the cauliflower to get a little crispy from the slow roasting. Slow roasting helps provide a tender vegetable while also crisping the florets but if you seal it in the foil, it will steam as opposed to roast. Great minds think alike. I am roasting cauliflower this evening. Great flavor combos with your recipe. Thanks Connie. 🙂 Roasted cauliflower is wonderful stuff. The chile, lime and cilantro take this dish to a different level. It’s probably our favorite cauliflower recipe. I’ve made this recipe twice, and there are NEVER any leftovers 🙂 My husband and I eat it ALL! Seriously, this is the best cauliflower recipe I’ve ever had. Thank you SO much! I am now making it for the 3rd time and it will become a regular in our home…I try to vary it with carrots and broccoli and it doesn’t matter which I do, my family loves it!! Again, thank you for this great recipe!! I generally roast my veggie @ a higher temp to get those lovely little browned bits … but I certainly did not miss them in this recipe. It was spot on! this is definitely on my list of things to try.. It looks healthy and delicious!! We think it’s great and hope you give it a try. This recipe is great! I have a whole new appreciation for cauliflower. Looks awesome! I love how versatile cauliflower is! Cheers! This is incredible! Made it tonight- sub. 2 tsp. chipotle chili powder for the listed chili powder. 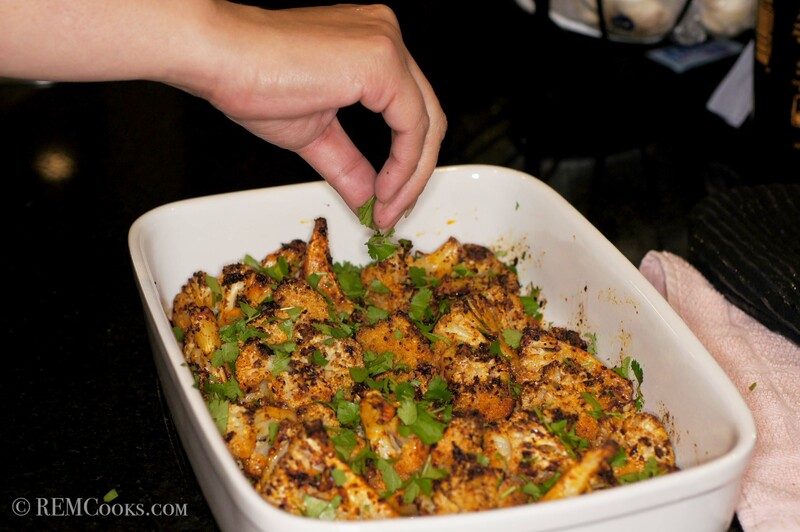 Thanks for sharing- The tastiest cauliflower we have ever eaten. Yum. It looks so good.I’m going to try this when I get an oven. Looks Great! Do you add the onions raw?? Same cooking time if you add broccoli and onions? Thanks. 🙂 yes, to both of your questions. The onions add a little more moisture to the dish. Could you grill this somehow? Trying to avoid the oven in this heat! I enjoyed this even before I baked it…oops! Thanks for a great recipe!! We’re glad you liked it and took the time to drop by and comment. 🙂 Thanks for taking the time. We have some other great recipes we hope you found, too. Well, I sure know what’s for dinner tonight. Yumm sounds really good ! Thanks, Lea. It seems almost everyone finds this recipe. It really is good and we like it a whole lot. 🙂 In fact, it’s our favorite cauliflower recipe. I love your detailed notes about variations and cooking times and temps – so helpful! I also love roasted veggies and will try your suggestions – thanks! Hi, Sharon. Thanks for your kind words. This post has seemed to take on a life of its own and is very popular on the Pinterest and elsewhere. It really is a wonderful recipe. If you do fix it, please let us know what you think. We love this dish and have made it a full meal by adding cubed sweet potatoes and a can of red beans about 15 minutes before it is done. Thanks for a great recipe. Just finished making this recipe, absolutely love how it came out! I’m not someone that ever eats cauliflower but I tried this recipe in hopes of eating more vegetables, and will definitely be making this more! Hi, MIranda. Thanks for such a nice compliment. We’re glad you like the recipe and it’s now in your culinary repertoire. It’s one of our favorites as it is for hundreds of others. Try it with broccoli or carrots. The flavor combination of chile, lime and cilantro goes with almost anything. I haven’t tried it with brussel sprouts but probably should. Perhaps a subsequent post??? I have no problem with people using our recipes as long as appropriate credit is given and there is a direct link back to the post/photo you use on your site. Thanks very much for asking. Made this last night, WOW! Absolutely delicious! As a New Mexican, you know I can appreciate this. Shared the recipe with my friends almost immediately. Thank you! Thank you so much for the excellent details in the recipe notes. 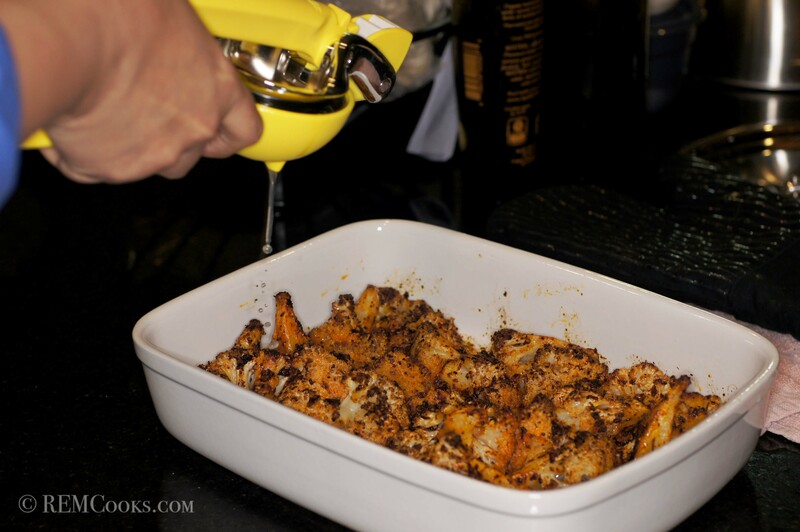 I love roasted cauliflower, but didn’t realize I was breaking down the olive oil in my high heat! Yes but the texture will be very different. Also, you need to adjust the cooking temperature to 400 F and use canola oil as opposed to olive oil. Pingback: whole30 weeks 4 and 5 - wrap up, results, and what next? I’m not the biggest veggie fan but I am gradually improving. However besides from all of that, this went down extremely well and is definitely worth a try. Glad you liked this recipe. 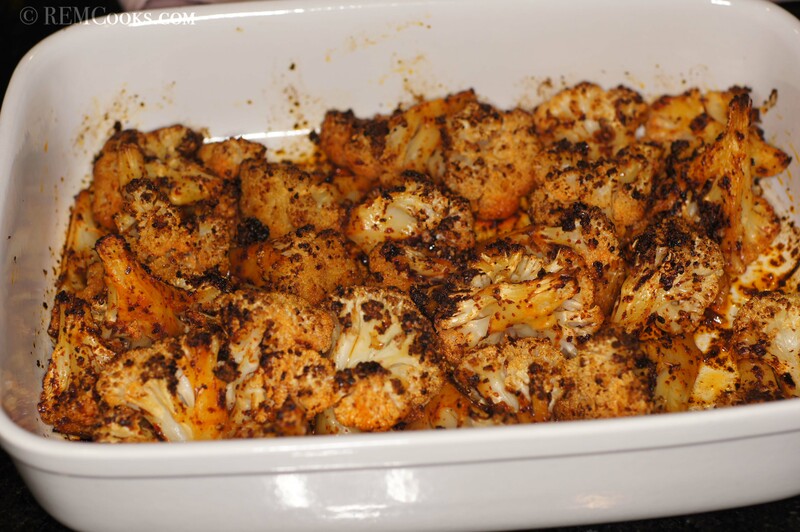 It is a wonderful way to make cauliflower and full of flavor. I would use something other than cilantro, hate the taste of that stuff. Maybe substitute parsley …and leave out the lime too. Parsley might be nice or you can leave it out if you like too.